Did you know that your phalanges – that’s a fancy word for your fingers and toes — correspond to your chakras (at least the first five)? If you’re a yoga practitioner, you can pay particular attention to what you are doing with your fingers or toes in your practice – especially if you are focusing on opening or becoming more consciously aware of the energy of a particular chakra. Or if you’re a ring-addict like me, you can play with the rings and symbols you wear on each finger so they have significance regarding the chakra to which they are associated. In this photo of the rings on my left hand – I put a simple ring on my pinky finger (first chakra) to remind me to stay simple like the first chakra, as I tend to get way overly-complicated (that is, live too much to my upper chakras). On my ring finger, I have a garnet ring to ground me, as I tend to be overly watery and second chakra. Garnet is a great business/first chakra stone. On my middle finger, I have a balancing symbol to keep my fire in check. I also tend to be very fiery. 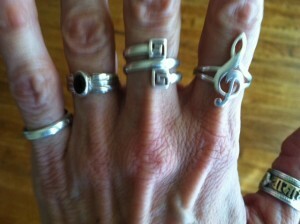 I like the balanced yin-yang look of the ring and that it is balancing right in the middle (balance point) of my hand. And on my thumb, I have an “om mani padme hum” – lotus rising out of the mud ring because it was a squeeze ring that was adjustable and could therefore fit over my big thumb knuckle (some decisions are ultimately just practical). The point is this. Your body is a beautiful, coordinated, symmetrical system, and there are endless ways you can celebrate your chakras. Everything that brings you more awareness of your energy center is a boon. So, next time you’re counting on your fingers or your toes, think about your chakras. Is there any benefit to our chakras by massaging or gently perssing on our fingers and/or toes? This particular post is about the more general concept of how your fingers and toes are related to your body’s seven main chakras, but there are also minor chakras in your feet and hands. You can look up reflexology to learn about how different areas of the body (which are related to the different chakras) can be affected by pressure and massage. I have heard through a naturopathic practitioner that having a ring on my thumb wiill ccause a blockage in energy pathways, thus throwing my polarity and ability to stay healthy all out of whack. Are you familiar with this concept? I’m sorry, but I’m not familiar with that concept. I haven’t really experienced it in my body, and I wear a silver ring on every finger. As a hypnotherapist, I know that when someone of authority tells us something, it sometimes doesn’t matter if it is literally “true” or not, because our subconscious mind takes it as truth, because it’s coming from someone who should know. I suggest you do some energy healing with a thumb ring and without one several times and pay attention to how you feel doing it each way. Be your own authority. I think we all have individual energy fields and we react different to metals and stones. I have some friends who love hematite, but it really makes me feel icky. As per my knowledge, you should never wear any ring on the thumb as then it starts attracting all sorts of negative energies and make you behave differently in the long run. Little finger = Heart chakra. Ring finger = Third Eye chakra. Middle finger = Solar Plexus chakra. First finger = Throat chakra. Thumb = Sacral / Sexual chakra. Heel of Palm / Wrist junction = Root chakra. Center of Palm = Crown chakra. Beth (comment above) you got it right. Vicki you have the fingers and chakras mixed up.